VENICE, Louisiana, June 25, 2010 (ENS) – Captain Mike Ellis is certain that when BP and the U.S. Coast Guard set fire to spilled oil on the surface of the Gulf of Mexico to keep it from reaching shore, endangered sea turtles are also being burned – alive. A short video clip of him making this accusation posted on You Tube by conservation biologist Catherine Craig has upset wildlife lovers and conservationists already distraught over the widespread pollution of the gulf from BP’s Deepwater Horizon spill. Since the oil rig exploded and caught fire April 20, leaving the wellhead broken and gushing oil for the past 66 days, at least two million barrels of oil have spilled into the gulf at the rate of at least 35,000 barrels per day. In an effort to keep some of that oil off the shores of four states, BP and the U.S. Coast Guard have been burning off some of the oil – and turtles floating on lines of seaweed are getting caught and burned along with the oil, says Captain Ellis. He has seen the burning up close. 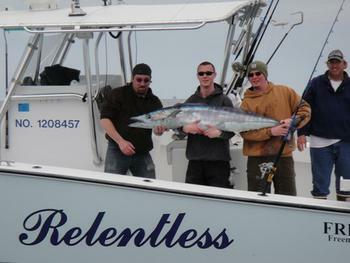 Before the oil spill, Ellis ran a charter fishing business out of Venice, Relentless Sportfishing Charters. In his 33-foot custom-built catamaran, Ellis took clients out to catch tuna, dolphin, wahoo, swordfish and snapper. The oil spill put an end to his fishing charters, so to support his family Ellis took a contract with the Florida Fish and Wildlife Conservation Commission and the National Oceanic and Atmospheric Administration, NOAA, to help save oiled wildlife. Then the turtles were shipped to the Audubon Aquarium of the Americas quarantine for further doctoring, he said. About a week into the contract, Captain Ellis says he encountered resistance from the U.S. Coast Guard and BP to his wildlife rescue efforts. Ellis has never actually seen a turtle being incinerated, but he is certain that they are being caught in the planned burns. 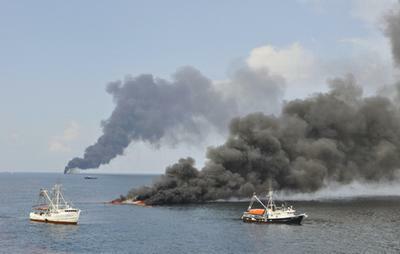 To date, 275 burns have been conducted, removing a total of more than 10 million gallons of oil from the open water, according to the Deepwater Horizon Incident Joint Information Center. The turtles being picked up for rescue and rehabilitation were mostly of the Kemp’s Ridley species, one of five species of endangered turtles in the Gulf of Mexico. Ellis says NOAA vets were able to rescue about 25 during the week his boat was under contract. He says NOAA found the sea turtle rescue effort “logistically” difficult. The agency stopped using his boat and he was not paid out for the original contract. Traveling through the oily water fouled his engine, which he has had to repair at his own expense. Although he has applied for reimbursement to BP, he has not yet received a check. “I can’t charter for fishing,” he said. NOAA has closed about one-third of the gulf to fishing to protect consumers from eating contaminated seafood. A few days after he was shut out of the burn area, Ellis was having lunch at the Cypress Cove Marina in Venice when he met Craig, who recorded his comments on video and posted it up on You Tube. Now, media are calling and emailing him day and night. Someone from the Louisiana State Attorney General’s Office came to talk to him, and he is also talking to environmental groups about further wildlife rescue efforts. Because Ellis still wants to help rescue turtles and other wildlife before the oil spill gets them. He is hoping now that a nonprofit group or coalition of groups will purchase a boat for him that is better able to withstand the oily waters of the gulf – a boat that would be used to rescue sea turtles before they are burned – alive.